In September 2010 Paul Barford raised some questions about the donors behind the Ancient Coin Collectors Guild (ACCG) Third Benefit Auction. The previous two ACCG Benefits Auctions have raised more than $80,000 to support the continuing rights of ancient coin collectors and businesses, everywhere, to pursue their interests. The ACCG consists of collectors and numismatic professionals who care passionately about preserving, studying and displaying ancient coins from all cultures. 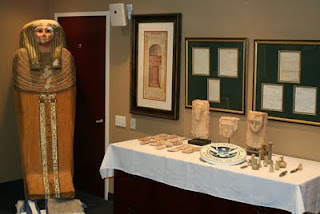 One of the key donors to the 2010 Auction was Holyland Numismatics (see e.g. here). Yesterday Salem Alshdaifat, the owner of Hoyland Numismatics, was one of several people charged. It is a matter of record that the ACCG has been challenging US import restrictions (see here). Yesterday's development suggests that there may indeed be some interesting pursuits of interest to emerge from this latest case. For this they gave you an award? I expected no less from Paul Barford, but David I harbored some small hope that you were cut from a bit different cloth. The situation is sad enough, for all of us, you didn't need to inflame it and beg for retribution. There are more than 750 members of the ACCG and something less than 100 of them are dealers. Many dealers and collectors have donated objects to past ACCG benefit auctions. Holyland Numismatics was among them in 2010. That firm was not, as you state, "a key donor". As you well know, the records of this case were sealed and ACCG was not at that time aware of any charges pending, nor of any history of investigations in progress. I would hope that you would rethink your position and focus on the case at hand, not on tarring everybody who ever breathed air in the same room as those charged. We should all remember that charges are one think and convictions are another. I have faith in the American legal system and will hope, whatever the outcome, that justice prevails. The association may be 'sad enough', indeed unfortunate, but it is there. We will, of course, see the outcome of the due legal process. Holyland Numismatics, Salim Alshadaifat's business is also listed as a financial supporter of the ACCG, a "patron". http://www.accg.us/about/contributors.aspx. I'm sure that they will change that list soon, but it can no doubt found in the Google cache for a few days. One would think that when accepting items for a benefit auction, the charity would at least conduct some basic due diligence as to the business practices of the donor in question. It is clear from the VCoins site of the dealer that he dealt (deals?) in middle eastern material in vast quantities, earth-encrusted (i.e. recently discovered) and had even indicated on his website he was importing things via Dubai. Two words for Wayne, "Casey Anthony". We all saw. Kyri, apart from the question where they came from and the lack of information regarding that in the sales offers, where do you think the "dealers lots" went? Do you think just three black sheep dealers bought the lot, or do you think that quite a few dealers bought them, not really knowing - or caring - how they came to be on sale where they were? When you have a few rotten apples in the barrel, unless you throw them out pretty sharply, before long you have a barrel of rotting apples. How much throwing out does the antiquities (in which I include the ancient coin) trade do? Which brings us back to the question of the due diligence the advocacy group for coin collectors did over the offers of material for their showpiece benefit auctions and who they accept as their patrons. The criteria for ACCG Patron membership is clearly spelled out on the guild website (http://accg.us). Salem Alshdaifat is a Patron member of the ACCG and has pleaded not guilty to the charges brought against him. He will remain a Patron member unless he is found guilty of those charges or the Board of Directors finds cause to revoke his membership. There's no need to check Google Cache, we don't work that way. I might add that the ACCG has ALWAYS opposed illicit activity and has done so vocally. The ACCG opposition to import restrictions is motivated by and based on the effect that such restrictions have on the licit market. To suggest (as some have done) that ACCG supports illicit activity because it opposes import restrictions on ancient coins is outlandishly ignorant. If you vociferously oppose all kinds of illicit and unethical activity, why don't you take a look at the business practices of those who provide financial support to your organization? You argue the coin trade is clean and not supplied much by people like the individual in question. Last year Paul Barford was able to tell there was a problem with the way this seller obtained material just by looking at his website! But you happily take donations and financial support from visible dealers without thinking of their business practices! You're either foolish, careless, or just don't care. If I list here a few members of the archaeological/anthropological profession who have been prosecuted for cultural property law violations, will you criticize the organizations they belong to for not being more diligent? BTW, why are you afraid to stand in the sunshine? I would. My whole blog is as much an indictment of UK archaeologists as the metal detectorists they support. But I cannot speak for a4bbbb20-aef6-11e0-88f1-000bcdcb5194 of course. What happened to "innocent until proven guilty"? Why is the ACCG not standing by its members here?